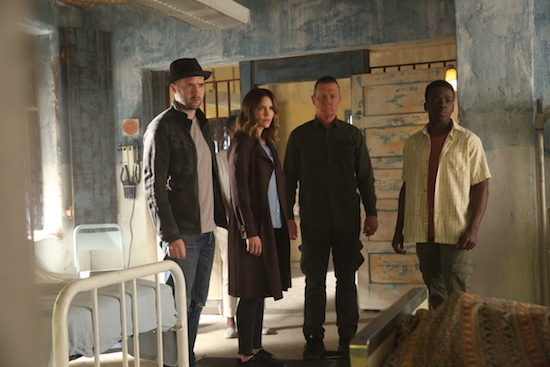 Team Scorpion is endangered when they travel to Africa to help the locals—and Walter (Elyes Gabel) ends up in over his head. But the group has their own issues: Walter and Paige (Katharine McPhee) deal with their relationship tension; plus, Happy (Jadyn Wong) and Toby (Eddie Kaye Thomas) make an important decision. I was really angry and disappointed in the finale of Scorpion. It made me angry to see everyone except Cabe treating Walter like he was garbage. Paige, Sylvester, Happy and Toby are all hypocrites. Paige says Walter is dishonest, what about her? She didn’t want to go to the lecture, but instead of her telling Walter that, she kept it to herself and then Walter has to overhear her telling someone she didn’t to go. Sylvester disappointed me by shoving Walter especially when Walter was right, Sylvester had opportunities to tell Florence and ask her out but he didn’t. It also isn’t Walter’s fault if Florence developed feelings for Walter, he can’t control how someone feels. They say they are a family, but family is supposed to be supportive, not walk out. Good riddance to bad rubbish and Walter can definitely do better than Paige!